Each time you walk up to a PhotoPass photographer, the experience is different. You never know if they will be serious, silly, or sentimental. 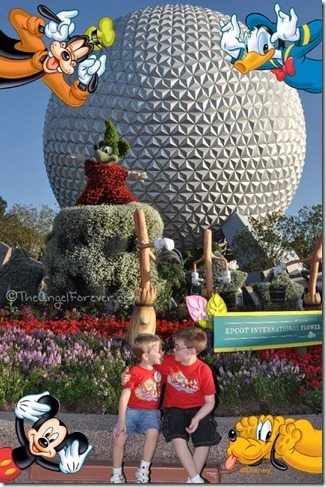 As we walked from the front of Epcot back to our resort for the final time, we stopped in the front for some pictures. The photographer did some with JSL and I as we were waiting for TechyDad and NHL to arrive. Then, he kept swapping people out when we were all there. The boys loved how silly he was. When I was editing them for our CD, I thought their pose and the border were simply perfect for each other. I haven’t seen that border before. Cute! And on such a fun picture too! That is such a cute pose! I love the characters and colors! What a perfect calendar shot!! Debs at Focused on the Magic´s last blog post ..Almost Wordless Wednesday ~ Happy August! Brotherly love! I love it when you get a PhotoPass photographer who is especially invested in what they are doing. Great photo. 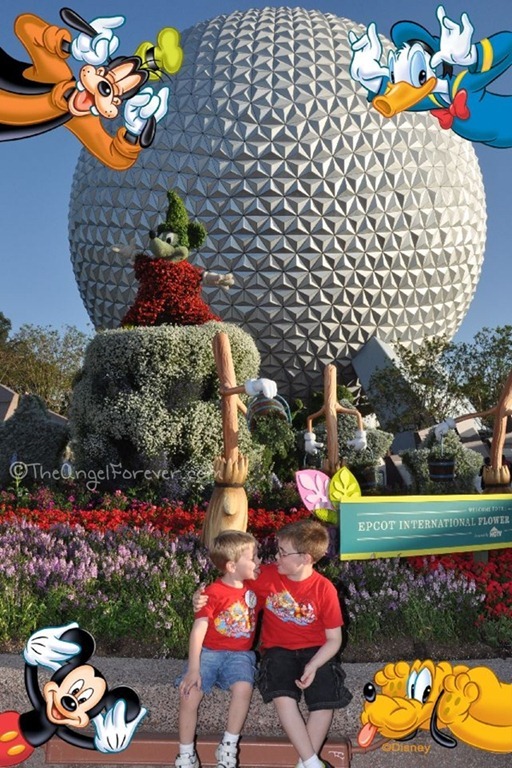 DIStherapy´s last blog post ..Our Disney Parks "Summer to Remember"
Exactly what I thought when I first saw it … such a fun, silly shot – and the perfect fun, silly border! What a great pic to have – thanks for sharing. That is absolutely adorable! What a great moment to capture!! So cute! I love the funny pose border and definitely perfect for this shot. I love how he captured the silliness and their affection for each other. How fun, love when you get to take these type of fun shots with the photographers, plus the boarder is perfect!